HÀ NỘI — Members of the German Asia-Pacific Business Association (OAV) are keen to explore co-operation opportunities in urban development, infrastructure facility, means of transportation, energy, environment and human resources in Hà Nội. Timo Prekop, member of the OAV Board, informed Nguyễn Đức Chung, chairman of the municipal People’s Committee, of the businesses’ intentions at a meeting in Hà Nội on Wednesday. 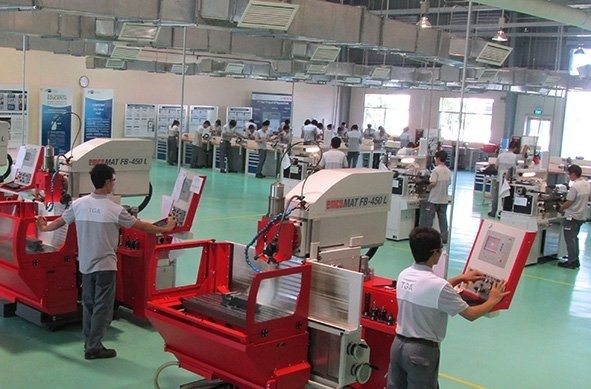 He said German businesses in general and OAV members in particular hope to receive assistance from the city authorities in seeking opportunities in Việt Nam. Welcoming the delegation, Chung said Hà Nội is working on some priorities such as upgrading the supply of clean water to meet European standards, planting one million trees, developing an environment monitoring system and improving local healthcare facilities and services. The city wants to apply European technologies in these fields, and a number of German advanced technologies have already been applied in healthcare, landscaping and wastewater treatment, he said. He called on foreign and domestic firms to invest in the waste-to-energy sector, build public toilets and clean lakes and ponds in the city. Underlining the fruitful co-operation between the two sides, Chung affirmed that in the coming time, the city will focus on sharing experiences, transferring technology and attracting investment from European firms, particularly German companies.